Doteasy Knowledge Base: What is "Member Zone"? Member Zone is your Doteasy account control panel. You will find your account's administrative functions in your Member Zone, including functions to manage your hosting and domain services as well as your Member Profile. Member Zone is located at https://member.doteasy.com. Account Profile - a summary of your account services, including expiry dates and storage and traffic quotas. 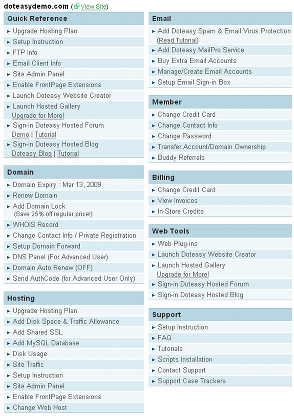 Control Panel - includes 8 sections to help you manage your Doteasy hosting and domain services.